Kitchen and Residential Design: Urban chickens? For the love of God no. I read an article on Re-Nest yesterday and it was about how to build a backyard chicken coop. Re-Nest is a website owned and operated by Apartment Therapy, an organization devoted to the propagation of inane ideas and harebrained schemes. Except of course, when they're quoting me. Apartment Therapy and it's ideological me-too-ers seem to be driving the idea that it's somehow a good thing for urban dwellers to start raising chickens. It looks like a new form of eco-narcissism to me but I'd be willing to take a look at that if anybody else has a better idea. Whatever's driving it, it's pretty flawed for a bunch of reasons. For starters, you need a flock of quite a few birds to yield enough eggs to wean you from the grocery store. Even then, I'd hate to have to depend on a backyard flock exclusively. In order to keep a flock going, you'll need to keep a rooster around. Once there's a rooster around you'd better get used to eating fertilized eggs. Trust me, there are few things more surprising than cracking an egg into a cake batter only to find a bloody pulp in the middle of the yolk. Not to mention that chickens are loud, aggressive, foul-smelling salmonella delivery devices. Why would someone want that in their life? On behalf of urban dwellers everywhere, please re-think the idea that a chicken has any place in an urban environment other than in a bucket from KFC. If you live out in the hinterlands, set yourself free. But let's keep cities chicken free zones please. We had chickens when I was a kid. The very spawn of Satan they were. Hens are aggressive and roosters are downright dangerous. That's a slight exaggeration, but not really. Chickens are not pets. You can attribute as much human emotion and intelligence to them as you want to, but they will not respond to you, they will not be affectionate and they will not look at you as anything other than an irritation at best. A rooster catches his breath between violent outbursts. Poultry Ireland. 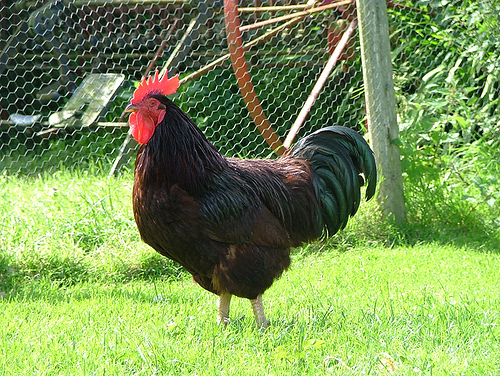 Roosters do not crow at dawn. They start crowing before dawn and they crow all day. Very loudly. Your neighbors will hate you. Hens form flocks and use their hive minds to plot murder and mayhem. We had a hen house when I was a kid and my brothers and I had to feed the chickens every morning before school. They figured out that there was a ledge over the door where they could roost. It took a day or two for them to then realize that the ledge was the perfect launch pad for an aerial attack. So it went every morning. Whoever's job it was that week had to go down to the chicken coop to feed the chickens. The second that he opened the door and entered, they'd pounce --spurs first. There's nothing quite like having blood drawn by a "domestic" bird at 5:30 in the morning, let me tell you. Due to chickens' foul dispositions and even more foul habits, this is trend with a built in expiration date. Knowing that makes it easier to read about. But still, save yourself the trouble, the expense, the physical and emotional scars. Chickens belong on farms. I was just out photographing chickens and there were three roosters on the premises. Now you know as well as anyone that I'm not afraid of animals, but roosters are nothing to mess with. 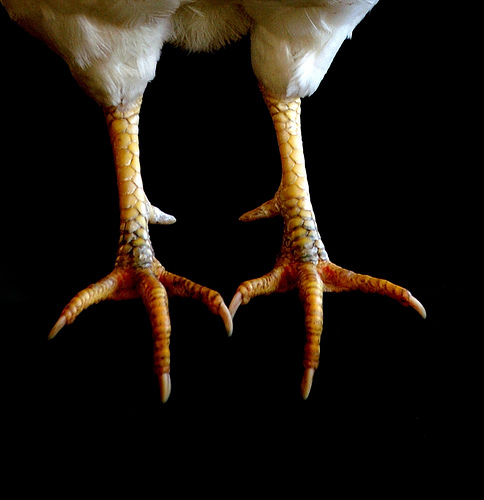 I really like chickens, but I absolutely agree that this stupid trend of urban chickenry will certainly end in disaster, just like every other novelty pet trend that comes down the pike - the animal shelters will be full of them and they'll end up abused and mistreated when the novelty wears off. Support your local farmers and buy their eggs. That's what I do, as much as I'd like to have my own flock. It's just not possible in our neighborhood. I didn't realize you'd been so scarred by them as a child! Melody: I saw your chicken post and as always your photos were great. So there were three roosters? I hope they had a lot of room for them. Had they been de-spurred? I can only imagine three roosters eyeing you as you were photographing the birds. Their therapod pea brains were plotting mayhem, rest assured. 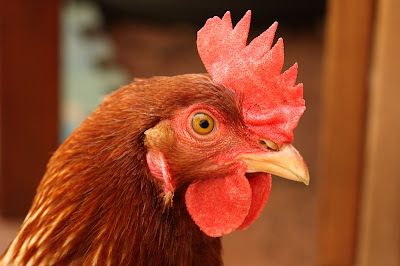 I am at a total loss when I see these urban chicken articles and blog posts. The people who embrace this cockamamie idea are the ones least likely to be able to pull it off successfully. Bonding with livestock is a one way ticket to disaster. I can understand bonding with a pig because they bond right back if you give them the opportunity. But chickens? Don't even get me started on the public health ramifications of an urban chicken coop. I had a friend who raised chickens on a hobby farm outside of Ottawa. She treated them like they were her chideren. When they got mites, she brought them into the house and washed their butts in the sink. When they got sick, she kept them in a box in the kitchen and wrapped them in blankets and fed them special diets. It bordered on the bizarre. Actually, not bordered -- it WAS bizarre!! On the other side of things, my grandparents moved to a farm and raised 50 chickens for food. I'll never forget the time I walked by the garage door and discovered a box filled with chicken feet. EEEEKKK!!! Chickens belong on farms and wild animals belong in the wild. Messing around with that is just asking for trouble. I always wonder about people who bond with things that can't bond back. My older brother had that unpleasant experience as you did with chickens as a 7 year old boy. His revenge: he threw the eggs back at them. That was the last of my parents bright idea to raise their own farm fresh eggs. The problem with throwing eggs at chickens is that it makes them fight with each other over which bird gets to eat the egg. Just buy a damn tiger and get it over with. I had chickens as youngster also. Nasty, smellllllyyyyyy, things. At least where I live in Southern California it is zoned against anything that belongs on a farm being in your back yard. Makes for better neighbors. Build the cute coop and use it as the garden shed. Much more useful. That is what it will become anyway, when you get tired of the chicks. Sue: I wonder how many people who are on board with this chickens in suburbia thing have any first hand experience with these horrible creatures. I suspect that there aren't many. Paul, after reading about your experiences with chickens, you may want to stay away from the island of Kauai -- it is overrun with chickens! 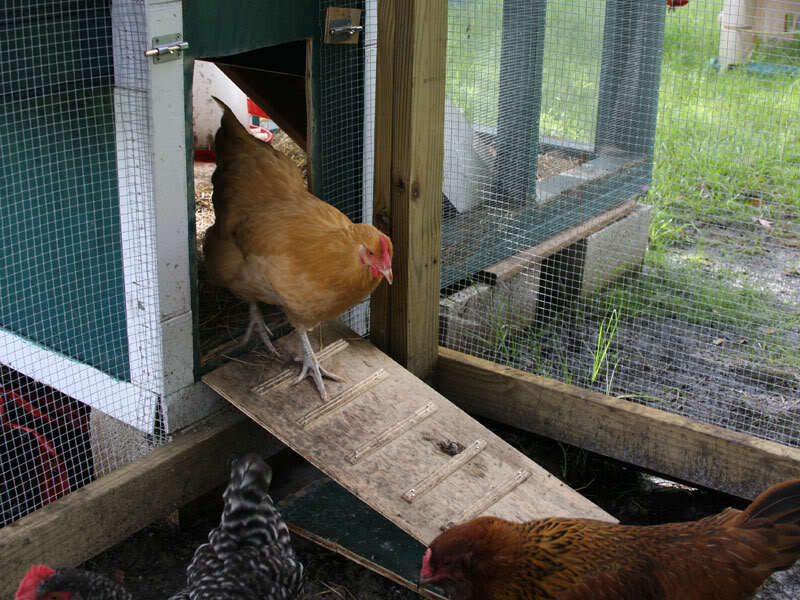 After the last hurricane (Iniki), all of the chickens were blown out of their coops. After the storm, no one knew whose chickens were whose, and the bigger problems like "hey we need power" and "where is my roof?" took precedence over rehoming the roaming poultry. Fast forward 17 years, and the chickens have multiplied exponentially. They are everywhere -- go to a park and imagine all the birds are chickens, and you will get an idea of how many rogue chickens there are wandering around Kauai! The most disturbing thing I saw while visiting there was flocks of chickens picking through the garbage at a KFC. That was just so wrong. So I suggest that if one wants to build a chicken coop on the roof of their apartment building, visit Kauai first. Indeed - this is a terrible idea! Actually, I lived in a small city where my neighbors had chickens...they escaped all the time. The geniuses (geniusi?) only built an 18inch fence around the "coop". Now, yes, we all know that chickens can't fly...far. But they can certainly jump 18 inches. After numerous occasions of trying not to run over a chicken as I backed out of my parking space, I was ready to just start mowin' 'em down for points. You're exactly right when you conjecture that the urban chicken promoters have no experience with the fowl/foul creatures. I loathe the chickens. It was my job to feed them when I was a wee tot of about five years old. I traded off with my brother and fed the sheep instead. It says alot when a five year old girl would rather be run over by a large sheep than approach a chicken. Needless to say, I was not at all saddened by the repeated visitations of a fox later on. I enjoyed your post. There are many contradictions to your extreme misunderstanding but it's almost a political issue so I'll just let your excellent and humorous writing stand, knowing I know better but we can agree to disagree. Ade: I did not know that about Kauai. Wide swaths of Florida are overrun with peacocks from similar circumstances. Are there any movements afoot to do something about the chicken squatters? Cham: Thanks for your comment and your RT on Twitter, I'm glad you're hanging around. Ours used to meet a similar fate though at the hands of a weasel instead of a fox. Despite my distaste for raising them, I think everybody benefits from knowing where their food comes from and how it ends up on a plate. Even so, I just don't want it in my 'hood. Granny: I like your style, you're welcome back any time. I am the king of outrageous statements and I'm glad you don't take me too seriously. Oh dear, I feel wretched. Paul, you have brought to the fore my offspring's distant tortured memories, feeding the fowl at five tender yyears of age. Mind you, I often felt the same... Hefting the hatchet on that fateful expiration date was cathartic, to say the least. I must confess, notwithstanding, I have an illogical fondness for chickens and their twisted worldview. I have to agree that it doesn't fit into an urban setting though. Most people would not share my views. Oh believe me, there were no tears shed on butchering day. I have no problem with other peoples' fondness for chickens even though I don't understand it. My only beef is when people who don't know better try to raise them in urban and suburban environments. Even worse is when they romanticize the idea of it. It's hard, difficult work. Oh you're so funny ("eco-narcissism"). I used to have to edit serious new stories about urban chickens and related legislation when I worked at a newspaper in Madison. And I think 6 households in the capital city actually had chickens. I'll be in Madison in August, I'll count the chickens while I'm there. Hah! Oh come come! Can 1,104 members of PDXBackyardChix (most of whom have their own flock) really be that misguided??? Personally, I have 7 hens in my SW Portland backyard, and they're little angels (mostly). I get about 4 eggs a day that are much better than store-bought and lots of lovely fertilizer. :) I think you're just jealous. P.S. Hens don't need roosters to lay eggs. Do women need men around to have their periods? I never said that rooster's necessary to have a hen lay eggs. I said that if you want to keep a flock going you'll need to have a rooster around. There's a big difference. I know a thing or two about chicken keeping from first hand experience. While I don't doubt that you have a perfectly fine time with your hens, on behalf of urbanites everywhere, they belong on a farm. I'm sorry that your experience with chickens was so bad, but it's not the only, or even typical, experience of backyard chicken keepers. Not by a long shot. 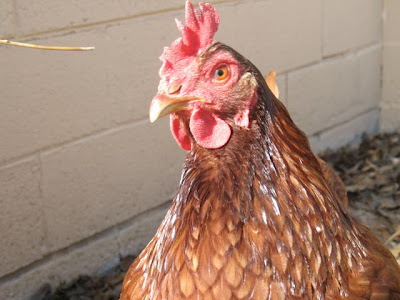 We have three New Hampshire Red hens that are completely docile, quiet, and well-behaved. They are excellent pets- they do not peck and come when they are called. They also meet my boys at the bus every day after school. As a matter of fact, we just had a two-year-old little boy come visit yesterday. The chickens waddled over to him, and let him pet them. We get enough eggs for ourselves plus many to give away with an investment of about $10/month in feed, 5 minutes a day in feeding/watering and collecting eggs, and 10 minutes a week shoveling out the small coop and putting in fresh bedding. Georgia: Thanks for your comment and I'm glad you're having a positive experience with your backyard flock. Please don't ever take me too seriously, my regulars know that I'm usually trolling for a laugh when I go off on a tear like this. How do chickens and rats get along in an urban environment? That's the real question. back to my childhood flashbacks. Our neighbor had a chicken run out her back door and that abutted our side yard. She had a hundred or so hens in there and they were surrounded by a four-foot high chicken wire fence. We used to catch mice and throw them over the fence. 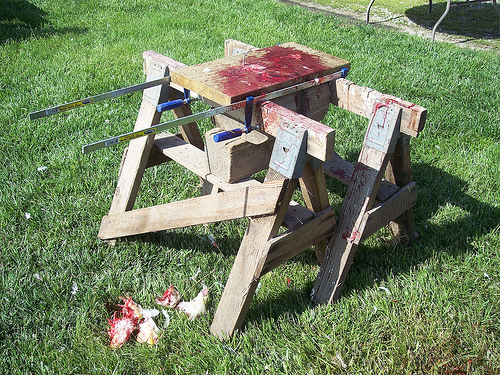 Hilarity would ensue as the blood thirsty hens chased down and ripped to shreds the hapless mice. This is the sort of thing that happens to children raised near chickens. Suburban moms take heed! Fast forward 10 year. My folks moved us city kids to a sheep ranch in Oregon. We knew people that had a chicken ranch. My high school art class caught the chickens for market to raise money for field trips. (We did art project too but this was more lucrative.) You do it at night with blue lights in the barns so the chickens are not frightened. If frightened they stampede into one end of the barn and smother each other. It's dirty nasty work. It took three days or so to work the ammonia out of my lungs. Later, we had to clean and pluck the stragglers. It took a lot of years to regain my appetite for fried chicken again. Fast forward to now. I have a parrot. Her eyes look just like the ones in the first picture of the rooster. I think she's smarter than a chicken --but maybe it's just because she can speak. It even seems like sometimes she really knows what she's saying! Well, she should know. She's had 34 years to practice! Her favorite food: chicken leg bones! I don't think it would matter if they were parrot bones. Anyway, she doesn't know she's a bird. Wow Jerry, do you feel better now? I would like to point out that your little bloging paper on why you hate chickens is not factual. Hens do not need a rooster to lay eggs. They leg eggs every day regardless if it is fertilized or not. Hens do not attack humans. I have come accross a nasty rooster, but they are only trying to protect their hens and chicks. As far as having a chicken in a very urban setting, I can understand where you are comming from. BUT I see it more as a bad thing for the chickens. Good day and next time write some factual info. I never said that you need a rooster to get a hen to lay. What I said was that you need a rooster to maintain a flock. Very different things and I can see than subtly and nuance is lost on you. I can write whatever I bloody please, this is my blog remember? And there is nothing not factual in this or any of my posts. Oh and you're welcome for the privilege to leave an anonymous comment. We have an chicken keeping league here called CLUCK in my town. We're a small city and the one section of the town that is allowed to have chickens is residential, but the homes are very close together...I've always wondered how neighbors feel when hipsters build chicken coops over there. Well I can only imagine. This hipster is determined to fight such inane zoning laws with every fiber of his being. Excellent way to double your number of comments: Respond to each one! OK, that last comment is just ridiculous. One, it is considered good netiquette, at least in design blog circles, to respond to all comments individually. Paul is one of just many who respect this accepted netiquette. Two, his blog is left open for public comments, even anonymous comments, as he supports the ability to express your own opinion. He has always welcomed all opinions in his comments, even (perhaps even especially) when they/we disagree with him. Three, name calling is cowardly. Shame on you. ps. For the record, I actually support urban chickenry. Wow, no one's called me a sad old queen before. That's such a brave thing to do. Anonymously. I had the same thought Adrienne, the exact same thought. Paul, you're an ignorant douchebag. How does anyone follow you. We stumbled on this and were shocked. Everything on here is false. Been raising chickens for a while and none of this is true. You don't need a rooster to maintain a flock. And you can have tons of eggs with a couple birds you idiot. Do some freaking research man, come on! Paul Anater, hahaha. Here's a little life lesson. When someone provides a forum on the internet in which you can express your opinions without being censored, calling the host of said forum an ignorant douche bag makes you look like a fool. I don't have to insult you back, you've already discounted anything you might like to say. Raising chickens in an urban environment is a bad idea. As someone who grew up in a rural environment and who raised chickens but who now lives in a city, I know exactly what I'm talking about.